Nowadays, many of us frequently keep our phones changing, just because new phones with advanced features are introduced almost on a daily basis in the market for smartphones. If you are looking for the best ways to transfer data from your old phone to the new ZTE Axon 7, you can do the same easily and safely using different methods. Now, let us discuss the two effective ways that will help you safely transfer data from your old phone to the new ZTE Axon 7. First, download the application from the official website of Androidphonesoft and install the program on your Windows PC or Mac Computer. The next thing you will have to do is to open the application on your computer and then click 'Switch' on the main screen. Now, you should connect the new phone and the old phone to the computer with the USB cables. Normally, the two phones will be detected by PhoneTrans and list the device name on the main screen. If not, then you should make sure USB debugging is enabled on Android phone and iTunes is installed on the computer if you want to transfer data from iPhone. The application window will show the source phone on the left side of your computer screen and the destination phone on the right side. In the middle of the screen, you will find the list of contents in your old phone like contacts, text messages, calendar, etc. Here, select the appropriate data that you wish to transfer and then click 'Start Transfer' option. All select data will be moved to ZTE Axon 7 in less than 10 minutes. In addition, you can find Flip option in the middle of the application screen along with other options. The Flip option can be used for changing the position of the old phone and new phone as source phone and destination phone respectively and vice versa. For effective transfer of data, do not disconnect both the phones from your computer till such time the process is completed. Erase Data in the new phone: If you have already saved some data in the new phone and if you do not want them to be present in the phone before the old data from your old phone is transferred, you can check the box against 'clear data before copy' option. 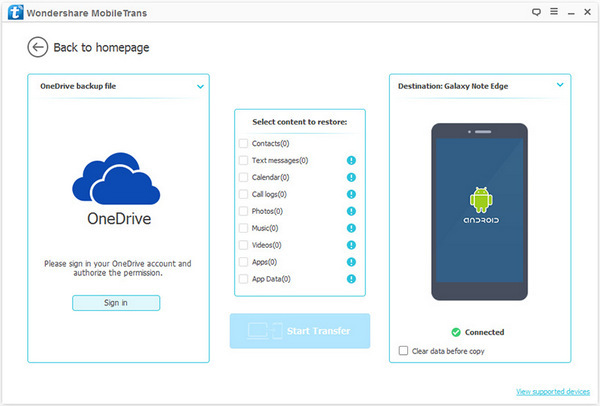 With this application, you can quickly transfer different types of data inclusive of contacts, applications, music, videos, photos, calendar, call logs and even text messages between not just Android phones, but also Windows/Blackberry devices. However, the process is a bit different from the method 1 if you switched from Blackberry or Windows Mobile. Here are the steps on how to do that. PhoneTrans can't directly transfer data from Blackberry or Windows phone because of limitations forced by Blackberry or Microsoft. 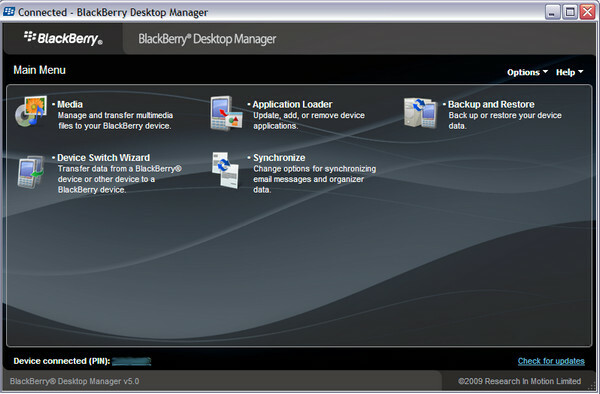 However, this program is able to extract data from the backup files made by Blackberry Desktop Software or OneDrive. The application can establish the connection between your phone and the computer only when the USB debugging in your old phone is enabled. You can do the same by visiting the Settings tab on your Android phone and this should be done based on the version of your old Android phone. 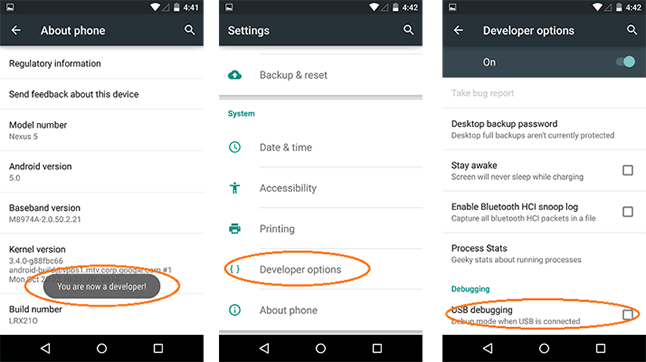 The reason is that the USB debugging can be enabled in different ways in different versions of Android phones. After it is done, please connect Axon 7 to computer via USB cable. 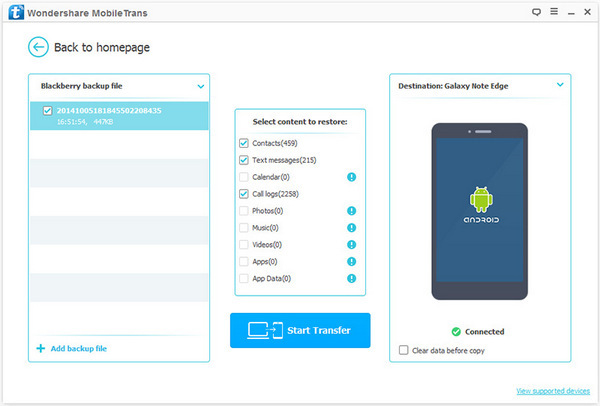 For now, you will have to do is to download and install the PhoneTrans application to your computer. Then, on the homepage of the application, you will have to click the "Switch" tab. For Barberry: From the next window, click 'Add backup file' on the bottom of left side. Then select the location of backup file on the computer. PhoneTrans will start extracting data from the backup file. Once it is finished, please check the data you need to transfer and click 'Start Transfer' button. For Windows phone: Select OneDrive from the drop-down list and sign in your account. The program will download backup data from cloud. Now mark the data you wish to transfer and start the transferring process by clicking 'Start Transfer' button. Honestly, PhoneTrans is the best software to transfer content between two phones. It is unique and powerful than all of the competitors. Besides data transfer, you can also use the program to backup phone data, erase private data on the phone before selling it to someone. It is the ideal solution if you changed the device frequently.